Airborne study by Andrew Wyeth, 1996. Andrew and Betsy Wyeth Collection, © 2017 Andrew Wyeth/Artists Rights Society (ARS). Opinion in the art world establishment has long been divided on the painter Andrew Wyeth (1917–2009). Some regard him as a brilliant realist, while others say his work is dreary and sentimental. There’s no such equivocation among the public, however: they adore Wyeth. By anyone’s reckoning, Christina’s World—his 1948 tempera on board depicting a young woman lying in an empty pasture and gazing at a distant house—is one of the most recognized and admired of all American paintings. Adam by Wyeth, 1963. Brandywine River Museum of Art, Chadds Ford, Pennsylvaniam gift of Anson McC. Beard Jr., © 2017 Andrew Wyeth/Artists Rights Society (ARS). Wyeth found the subjects of his art in the people and landscapes of the two places from which he rarely strayed: his native Brandywine River valley in Pennsylvania and coastal Maine. To mark the centenary of Wyeth’s birth, museums in both locations are mounting major exhibition programs. 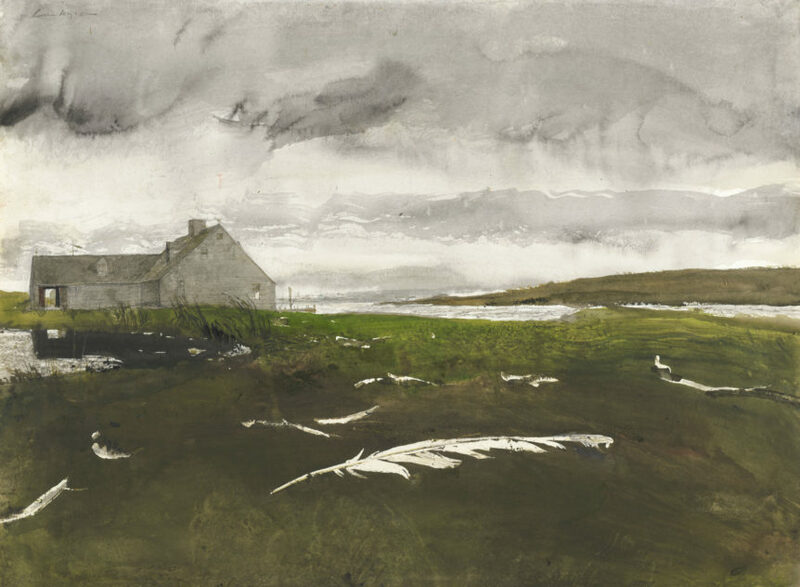 The Farnsworth Art Museum in Rockland, Maine— about a dozen miles up the road from the Wyeth summer place in the village of Cushing—hosts five exhibitions this year under the title Andrew Wyeth at 100. The series kicked off in March with a show devoted to Wyeth drawings, as well as a dossier exhibition on his macabre 1981 vanitas painting Dr. Syn. Later events will dedicate similar attention to Wyeth watercolors and his forlorn 1963 panel Her Room. In Chadds Ford, Pennsylvania—the town where Wyeth was born and died—the Brandywine River Museum of Art is mounting Andrew Wyeth: In Retrospect, a major survey of the artist’s work. The exhibition divides the artist’s long and dynamic career into four chronological chapters, examining in turn his formative years; his emotionally charged landscapes and portraits of the 1950s and the 1960s; his strange turn to eroticism in the late 1960s and the making of the infamous Helga portraits; and the reflective, inwardlooking paintings of his final decades. The show travels in October to the Seattle Art Museum, and is accompanied by a fully illustrated catalogue. Pentecost by Wyeth, 1989. Private collection, © 2017 Andrew Wyeth/Artists Rights Society (ARS). Even the United States Postal Service is getting in on the celebration: it will issue a pane of stamps on July 12—Wyeth’s birthday—depicting twelve of the artist’s best-known works. Finally (via the mail, at least), Wyeth will be traveling a bit.